Having been a huge fan of the original AoD Madeira cask finish, and realising that the 2nd release (Bourbon cask) wasn't going to be available for regular retail sale, I was keen to get my hands on a bottle. 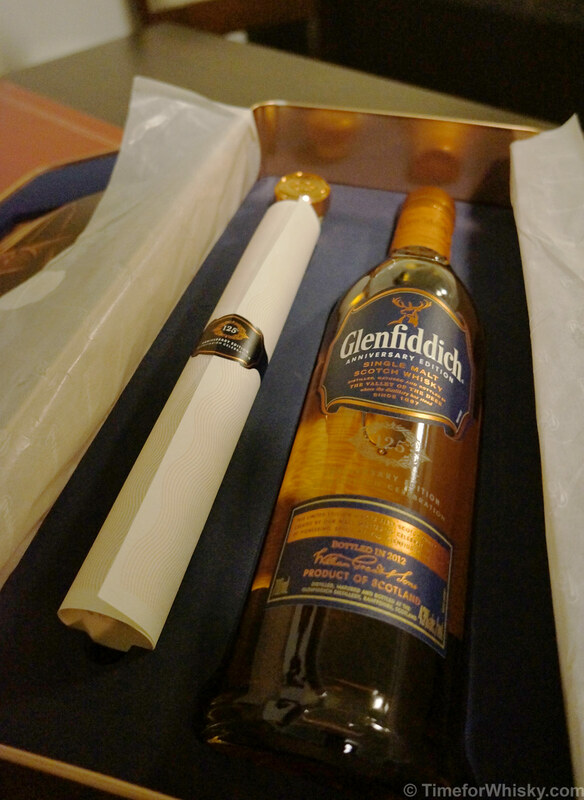 As for the 125th Anniversary - a peaty, limited edition 'fiddich? Too interesting to pass up! Both are presented in typical limited edition Glenfiddich fashion - i.e. very well, in sturdy and attractive boxes with (in the case of the 125th Anniversary) a few extra add-ons (call them gimmicks if you like, I think they're pretty nice) - a signed certificate by Malt Master Brian Kinsman, a (very heavy) solid copper bottle stopper, and a small booklet on the malt. ..but enough of the small talk. How do they taste? Nose: Peat! Not in a "blow your head off" Ardbeg style (as much as we all love it), but not in the subtle "hello, I promise I'm here!" style of say the Caoran Reserve either. 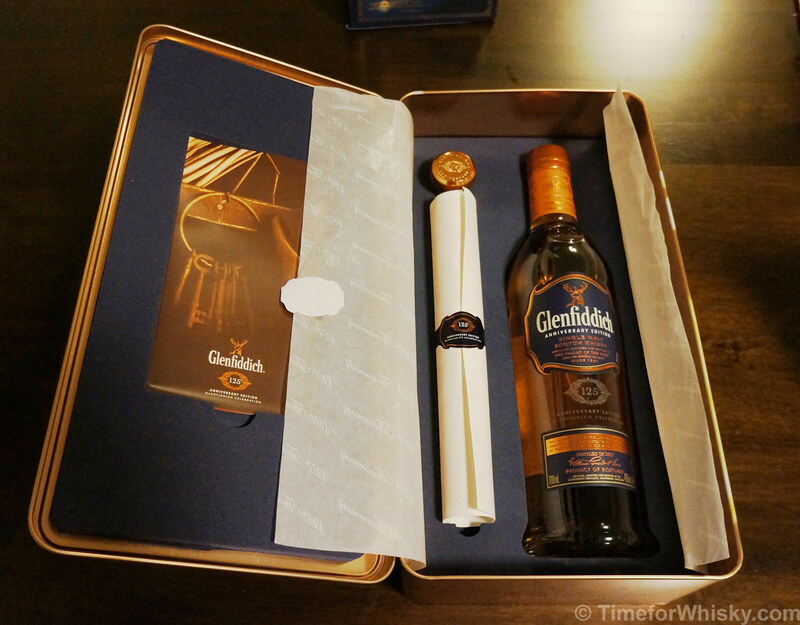 Certainly not what you expect from any Glenfiddich. Pleasant though. While the smoke is hard to ignore, it reminded me more of an Aussie peated whisky (like say, Hellyers Road Peated) than a subtle Islay. There's a slight fruity sweetness too. Palate: Vanilla, smoke, again - reminiscent of the Hellyers Road Peated. Pleasant, but you can only just tell it's a Glenfiddich. 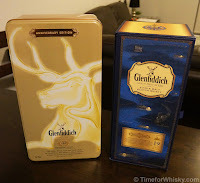 Certainly the most different Glenfiddich I've tried. Finish: All the vanilla, sweetness, fruitiness clears, and leaves smoke. Not overpowering, but definitely the dominant characteristic. It lingers, but doesn't overstay its welcome. 125th Anniversary, but not by much. Nose: Vanilla - a big hit of sweet vanilla at first. Slight notes of banana, maybe a hint of pear? Palate: Bananas, pear. The vanilla sweetness so evident on the nose is nowhere to be found. Finish: Apple and pear. Not dissimilar to Glenfiddich 12yo, but much smoother. Not a long finish, but not too short either. 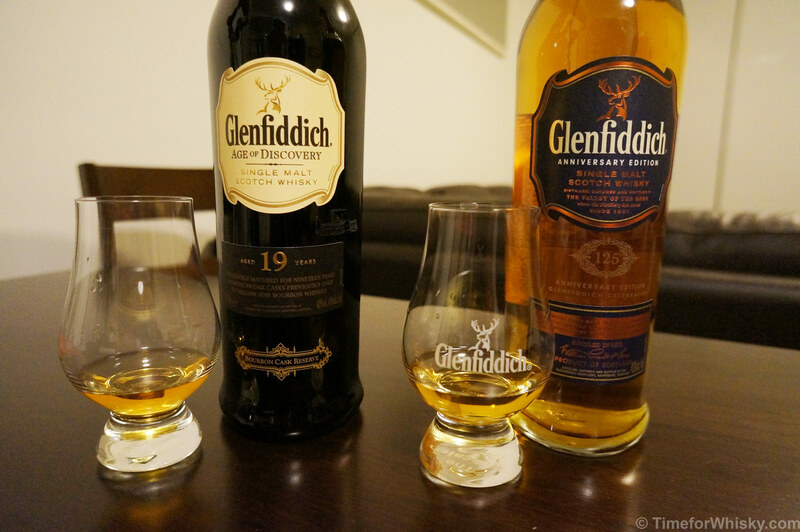 All up, two very enjoyable whiskies. While I slightly preferred the AoD Bourbon cask finish to the 125th Anniversary, I'm very glad I grabbed a bottle two bottles of the latter. If it's anything like the Snow Phoenix (just search eBay), it's sure to be a popular and highly sought-after dram! Most whisky fans would be all too familiar with Laphroaig's standard 10yo offering, and likely their Triple Wood and Quarter Cask releases too. Perhaps even their 18 and 25 year old releases, if lucky enough. Not everyone would have heard of the 15 year old however, largely because it was discontinued some years back, replaced by the 18 year old. Since then, bottles have been going for silly money through some outlets, so when I came across the chance to buy a bottle for a decent price last year, I jumped at it. I always enjoy having whisky with a backstory on my shelves, and if that whisky is no longer sold, even better. Nose: Peat smoke, but not in your face as you'd expect with an Islay (especially a Laphroiag). Fresh fruit, sweet, but with a smokey undertone. Pleasant. 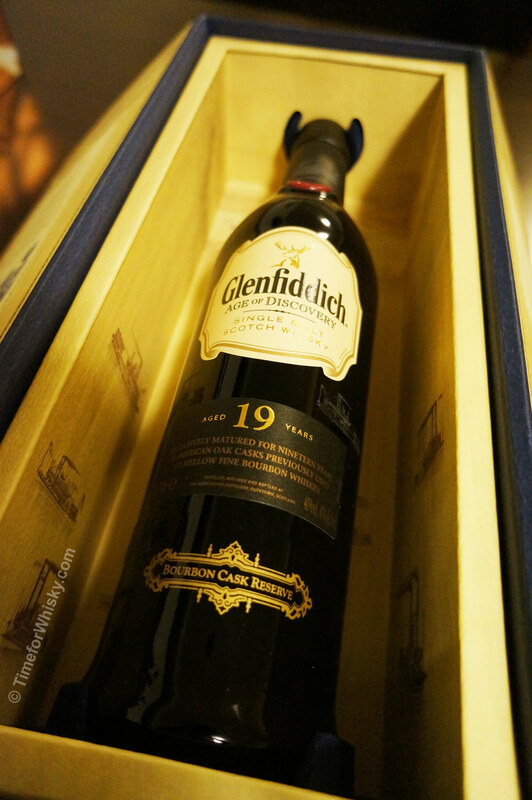 Palate: The peat is initially subdued, with the sweet characteristics found on the nose coming through. The peat quickly shines through, though not overpowering. Finish: Hmmm, odd. It's a long finish, but the smokiness only remains for a little while at the back of the throat, What really lingers is the spice. Warming, but not smoky in the way (say) an Ardbeg finishes. Pleasant, but different. Jim Murray called this a "hugely disappointing, lacklustre dram" and "woefully short on complexity" but I can't agree. It's not my favourite malt, not even my favourite Islay malt, but it's unusual and complex in a way plenty of Islay malts aren't, and overall a very pleasant dram. William Grant & Sons Australia have recently announced that the Hudson range of American whiskies (which you may been lucky enough to try if you visited Whisky Live last year) have transferred from Vanguard Luxury Brands to WG&S. 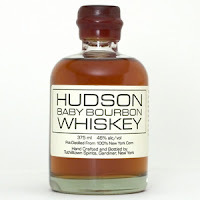 For those of you not familiar with Hudson, it's a range of craft whiskey distilled by New York based distiller Tuthilltown Spirits Company, consisting of two Bourbons, a Single Malt, Rye Whiskey and Corn Whiskey. 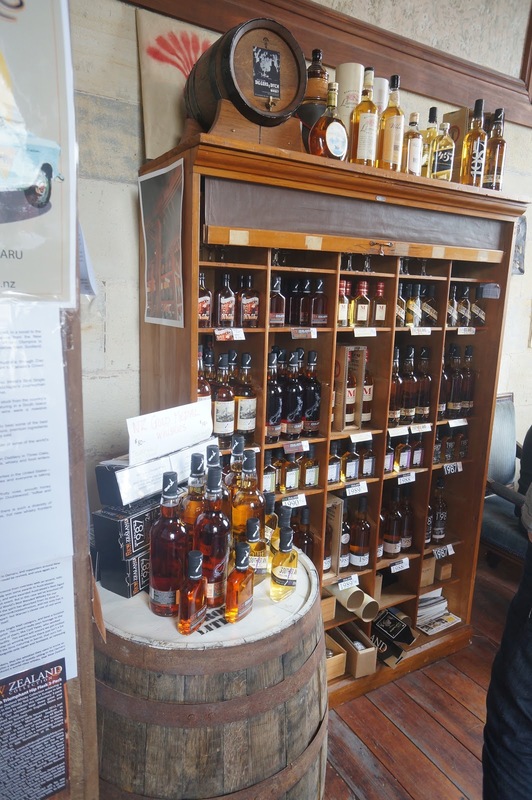 Bottles are sold in 350mL format and, speaking from experience tasting the Bourbons, Rye and Single Malt, are all excellent whiskies produced with extensive experience and care. Vanguard Luxury Brands based in Coogee and managed by James France, has been handling the brand in the Australian market for the past three years - taking it on prior to William Grant & Sons ownership - and has been successful in seeding the range into many of Australia’s top bars. WG&S Australia plan to focus efforts on the Baby Bourbon and Manhattan Rye, and we can only hope this means seeing these in more bars and bottles hops in the near future. In the interests of keeping this blog a little varied (while still focusing on whisky), on occasion I'll include the odd bar review. I mean we all need to drink that whisky somewhere, right? With that in mind, I couldn't think of a place to start than the recently-opened Bulletin Place in Sydney's CBD. Opened in late December, Bulletin Place sits in a little-known laneway near Circular Quay (funnily enough called Bulletin Place). With the bar's increasing popularity (not to mention Tapavino next door, who'll supply the food for Bulletin Place), it won't remain "little-known" for long. 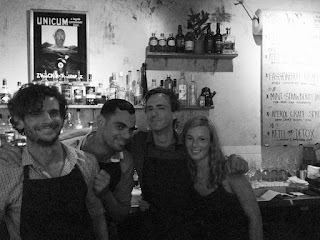 Bulletin Place is a labour of love from three of the industry's best bartenders - Tim Philips (some may know him as the 2012 Diageo Reserve World Class Global Bartender of the Year), Robb Sloann and Adi Ruiz, all three of whom passed through Melbourne's famed Black Pearl at one stage or another, and all of whom have held court behind the bar at some of the country's best cocktail dens. With space for 50, Bulletin Place isn't a big bar, but it's a bar with a lot of heart. The focus is on fresh produce, and the cocktail menu changes daily based on what the guys can get their hands on. The back bar is all about quality over quantity, and there's a mid-sized but well-curated selection of whiskies (stored in a crate on the bar, rather than hiding behind it). Whiskies include Talisker 57deg North, Glenlivet 21, a few Ardbegs, Yamazaki 18yo and a very tasty cask-strength Bakery Hill. A great mix of regions and world whiskies for such a small bar. Steph (my wife) and I have visited twice now (both times Tim wasn't around - the life of the World's best bartender is a busy one it seems!) and both times Robb and Adi really made everyone feel welcome. One thing that really struck me about these guys is that they always seem to know what we want in a cocktail, even with such vague instructions as "short and strong, please". It's the same thing I experienced when I was luckily enough to visit ivy's Level 6 on my buck's night just over a year ago - every cocktail Tim made back then was spot on. Of course, they also have a small but well thought-out selection of wine and beer for those who like their drinks simpler. The crowd seems to be a mix of city workers, bartenders and generally anyone looking for a friendly venue with great drinks (when we last visited, a few of the Chaser gang were enjoying drinks in the corner too). 9pm on a Friday was busy, but certainly not uncomfortably so (and most importantly, we were able to grab two seats at the bar - always sit at the bar!). 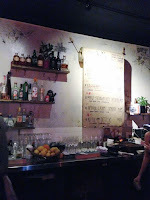 Bulletin Place is open Monday to Saturday, 4pm to midnight and is sure to only get more popular as word gets out. Add it to your list of Sydney bars to check-out this Summer! 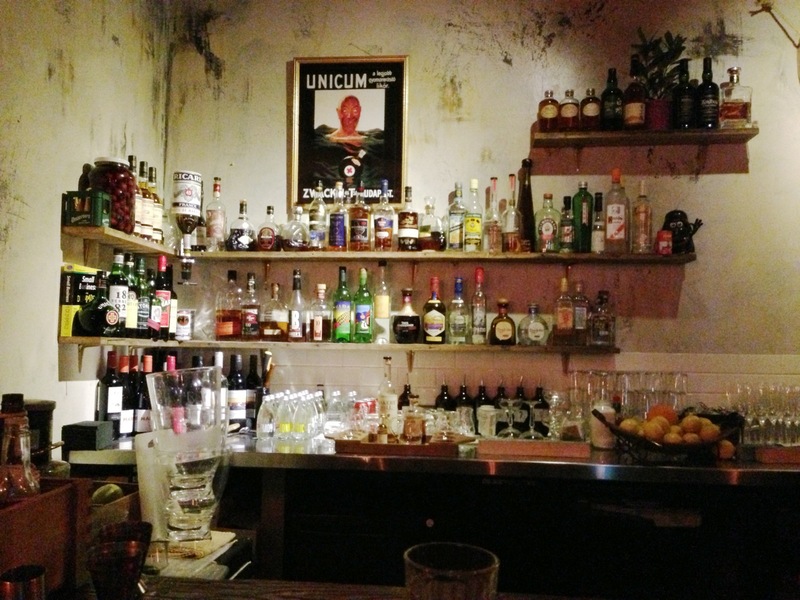 PS:....oh, and on our last visit, they had the Stones cranking on the stereo. Does it get any better?